This commentary was written by Dr. Daniel Thornton of D.L. Thornton Economics. Stephen Moore has been vilified in some circles since being nominated to the seven-member Board of Governors of the Federal Reserve. I don’t know whether Moore is qualified for the job. But I’m certain that some of the attacks are completely bogus. Americans do not favor technocracy — rule by experts. A necessary exception is the Federal Reserve, the central bank, which, also by nature, is a technocratic institution. It takes integrity and common sense, but also highly specialized knowledge, to manage the U.S. money supply, perhaps the most important factor in the global economy. One would think that a newspaper located Washington D.C., and has reported on the Federal Reserve since its inception, would have a better understanding of the Fed’s monetary policy. The Post is obviously unaware of the fact that none of the current Fed policymakers pay any attention to “the most important factor in the global economy,” i.e., the money supply. They care only about interest rates. The Post is also oblivious to the fact the neither the Fed nor monetary policy is now or has ever been “technocratic” by nature. I spent 33 years at the Federal Reserve Bank of St. Louis as a research economist. Like nearly all research economists, I have published papers that could be called “technocratic.” I have on occasion accompanied the St. Louis Fed president to Federal Open Market Committee (FOMC) meetings. Furthermore, I have read many of the verbatim transcripts of other FOMC meetings. I can assure you that none of the policy discussions I have witnessed or read require specialized technical knowledge. If that were true many of the past governors and Fed presidents, and some of the current ones, could not have participated. The idea that monetary policy is technocratic is due to the fact that Fed governors and Fed presidents increasingly have come from the ranks of professional research economists who engage in esoteric, technical model building. Making this a requirement for being a governor or president would set a dangerous precedent! These economists use variants of the same basic model. This wouldn’t be so bad if the model was an accurate representation of the real economy. But it’s not. It is an extremely poor description of the economy. Even if the model was a more accurate, it is dangerous to have monetary policy made from a narrow perspective. Fed governors and Reserve Bank presidents should come from a variety of professions and backgrounds, so long as they are smart, analytical, and circumspect. I doubt Moore meets these criteria. However, he should be judged by this standard, not by whether he is an economic technocrat who knows how to manage the U.S. money supply. 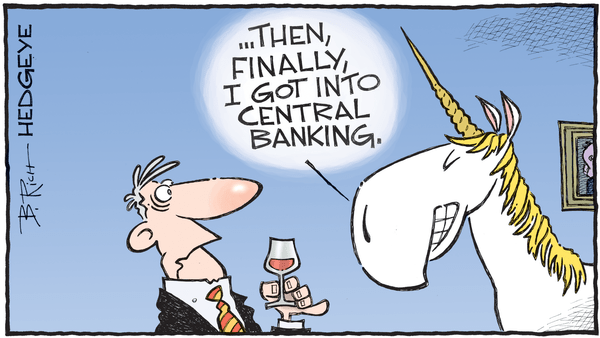 This is a Hedgeye Guest Contributor piece written by Dr. Daniel Thornton. During his 33-year career at the St. Louis Fed, Thornton served as vice president and economic advisor. He currently runs D.L. Thornton Economics, an economic research consultancy. This piece does not necessarily reflect the opinion of Hedgeye. CHART OF THE DAY: Have Consensus Expectations Fallen Enough?